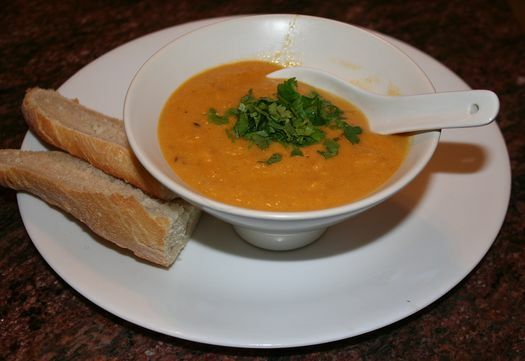 The weather has taken a cold turn these past couple of days, and that’s put me in the mood for soup! This creamy and delicious chickpea soup is a favourite. The coconut milk makes it very rich and satisfying, and the combination of spices gives a complex flavour. I originally snagged the recipe online, though I’m not sure from where. It was called “Rudi’s Soup”, and all I can say is, Thanks, Rudi, for concocting such a fabulous belly-warming delight. The ingredients list may look long, but it’s mostly spices. If you’re starting with dried chickpeas, use 110g (generous 1/2 cup), soaked overnight and cooked until tender. Or use a 400g / 14oz tin, drained & rinsed. 1. Heat oil in a heavy saucepan over low heat. Add cumin seeds, bay leaf, cardamoms and clove. When the seeds begin to crack, add the chopped onions and saute until golden brown, about five minutes. Stir in the garlic and ginger. Saute for one minute. Remove and discard bay leaf. 2. Add turmeric, coriander, cumin powder, paprika, pepper and pinch of ground cayenne pepper. Be careful not to burn the spices! 3. Add chickpeas to the saucepan. Add diced tomatoes, vegetable stock and salt to taste. Simmer, partially covered, on low heat for half an hour. 4. Remove half the chickpeas from the saucepan, and blenderise with the coconut milk until smooth. Pour the blended mixture back into the pan simmer an additional 15 to 20 minutes. Adjust seasoning with salt to taste. Serve hot, with chopped cilantro leaves as a garnish. Oh my goodness, that soup looks wonderful! All those lovely spices…sounds like wonderful cold weather food! Beautiful color too! Oh and can I just boast that we still haven’t lit our fire yet? Jeni — ooo, do you have a real wood fire? Would love one of those, but sadly, our house lacks a chimney. We fitted a log burner in February, the chimney was already there. It is still beautifully warm here (21 degrees). January and February are the coldest months here and you can bet I’ll be moaning about the cold during then. Spanish houses are so freaking cold it’s ridiculous (designed to stay cool and not warm like UK houses). I am very excited about lighting the fire though and it will get lit in the next few weeks. We’re like kids with a new toy lol.